NOTE: The following article contains much of the same content as in the articles Model Comparison – Sol/206 and New in SMC v9.7.15 Model Comparison Improvements but is updated with screenshots of the new interface of Solibri Model Checker (SMC) v9.8. If you are running an earlier version of SMC, please refer to the previously published article(s). Solibri Model Checker (SMC) has a very powerful rule template named Model Comparison (Rule Template # SOL/206) that is able to compare two versions of an IFC model for differences. This rule template is used in the Model Revisions Comparison – Architecture ruleset found in the Architectural folder of the rulesets included with SMC. The following article will provide an additional explanation using the Model Revisions Comparison – Architecture ruleset and two versions of the SMC Building sample models that come with SMC. First, open SMC v9.8 and set your role to BIM Validation – Architectural by clicking File > Roles > Open. By using this role, when you click the Add Rulesets button in the Checking View, the Model Revisions Comparison – Architectural ruleset will be listed in the dialog box that opens, with the default rulesets included in this role. NOTE: The Model Revisions Comparison – Architectural ruleset will not be loaded automatically when you open an IFC since it is not “Starred.” If you wish to have the ruleset automatically open in the Checking view, you must “Star” its listing in the Roles window and resave the role (see above). Now that your role is set, click File > Open Model… and open SMC Building.ifc and SMC Building – modified.ifc found in the Samples\IFC folder. After the IFC models load, leave the Ensure Model Disciplines dialog as it is with both models set to Architectural and click the OK button. NOTE: The Model Comparison rule template is for comparing IFC models, not SMC models. Solibri Model Checker is unable to load multiple .smc files at the same time. With the two versions of the same IFC model loaded, you can now open the Model Revisions Comparison – Architecture ruleset. Select the Checking layout tab at the top of the SMC window, and you’ll notice that the BIM Validation – Architectural, General Space Check, and Intersections Between Architectural Components rulesets have already loaded by default using the role you previously selected. If the To-Do dialog opens, you can simply click the X button in the top right corner, as you won’t need to verify any of these tasks to ensure the results are accurate. Click the Add Rulesets button to add the Model Revisions Comparison – Architectural ruleset. If you want, you can right-click the other three rulesets listed in the Checking view and select Disable to save time by not running those checks. Click the Check button in the Checking view and select the Component Comparison rule under the Model Revision Comparison – Architectural ruleset to view its results in the Results view. You may notice a result stating Incorrect Model Timestamps (see below), warning that the Old Model set in the Rule Parameters does not have an earlier Timestamp than the New Model. This is due to the modified IFC being saved prior to the original model. It is important to point this out since with the Old Model and New Model set incorrectly, the rule will incorrectly report components as being added that were actually removed and vice versa. You can ignore the Incorrect Model Timestamps issue as it is a non-issue. To view the rule’s parameters right-click the rule in the Checking view and select Rule Parameters. At the top of the Parameters Dialog Bow (see below) you’ll find drop-down boxes for the Old Model and New Model. Set the Old Model drop-down box to SMC Building and the New Model drop-down box to SMC Building – modified (see below). Notice next to the drop-down boxes, you can set the colors for the Old Model and New Model. By default, the Old Model is set to a red color with 60% transparency and the New Model is set to a blue color with 60% transparency. Therefore, if a component was removed, it will show up as Red, since it only existed in the Old Model. If a component is added, it will show up as blue as it only exists in the New Model. If a component is modified, it exists in both the Old Model and New Model. If the modified component moved to a new location, you’ll see the component in two different locations: one as red and one as blue. However, if only a property was modified for a component, the component will reside in the same location in both the Old Model and New Model, in purple, caused by the overlapping colors of the components. Next, you’ll notice under Checked Components, we are checking Any components from an Architectural Model, but Excluding Openings and Spaces. These are excluded since spaces will be checked on their own in the Space Comparison rule and openings are normally created by doors or windows, which will already be compared. NOTE: By setting the Component column under Checked Components to Any, only components that have geometry will be checked. This doesn’t include container components such as Buildings, Floors, Systems, etc. If you wish to compare container components, you’ll have to add a row to the filter to Include those individual container components as well. Below the Checked components, is a checkbox labeled “Geometries”. When marked, a result is returned for any component that has had its actual geometry (what you see in the 3D View) modified. Below that checkbox is the “Compared Properties” list. Here you can add any property you wish to compare across versions of a model. To add a property, click the Insert Property button. A dialog window will open and allow you to select from a one of the property groups. Lastly, Model Comparison is one of the rule templates in SMC that has a configurable report. The Report section of the Parameters dialog (see above) allows a user to customize what columns are included in the report. The table on the left allows a user to specify which classifying columns to report and their order. These are the left-most columns of the report that will sort the components in the report by their column values. 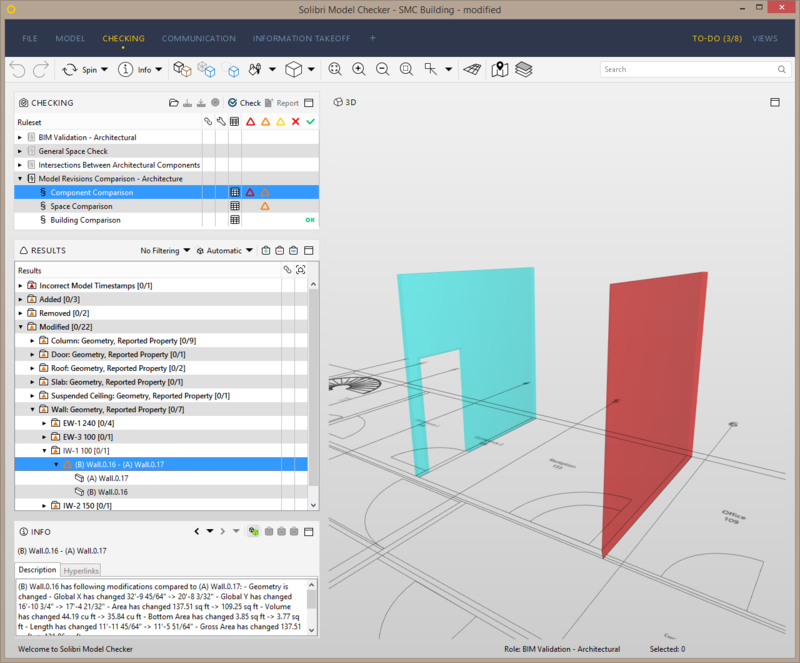 The table on the right in the Report section of the Parameters dialog (see above) allows a user to specify what components and which of their quantity and location properties to report. For example, in the report of this rule, components will first be grouped and sorted by the floor they are located on, then by the component (Door, Wall, etc) they are, and then by their Type. You’ll also notice that Roofs, Slabs, Walls, and Suspended Ceilings will have their Areas reported, though not their Lengths. Only Beams and Columns will have their Lengths reported, but not their Areas. Set the Old Model and New Model drop-down boxes to SMC Building and SMC Building – modified respectively in the Rule Parameters of the Space Comparison rule in the Checking view as you did for the Component Comparison rule. Now that the Rule Parameters are better understood and correctly set, click Check in the Checking view to re-run the check. In the Results view, notice there are three categories of results listed: Added, Removed, and Modified. Double-click and expand the Added category to zoom to the components that were added in the modified model. You’ll see that a door, a suspended ceiling, and a wall have been added to the modified model. Again, as these are components that only exist in the New Model, they show in the 3D view as blue. You can see that it moved in the 3D view as it is shown in two locations: in red from the Old Model, and in blue from the New Model. Notice the sub-category states “Wall: Geometry, Location, Quantity”. The results are organized first by what the component is that has changed and then by what has changed about that component. The Geometry has changed since an opening was cut out of the geometry of the wall for the door that was added. The Location properties have changed since the wall itself has shifted locations. The Quantity properties have changed since the area of the wall is now smaller due to the opening that was cut out of it. Also notice that when you select the result in the Results view, you see a detailed listing in the Info view of all the properties and their values that have changed. In the Results view, expand the Removed category until you find the “Double Sash Window 16” result of a window that was removed from the model. You can see that the window was removed in the modified model as the window only appears red in one location (where the modified wall was later moved to) from the Old Model. Double-click the Report icon in the Checking view to open the report of the results of the Component Comparison rule. You’ll see changes that have been made to components, which are sorted first by the floor that they are located on, then by what component they are, and then by their Type. For example, when viewing this report we see that 2 Door components of Type Door 16 have been added to the Ground floor level in the modified model. We can also see that 15.07 sq ft of Wall of Type EW-3 100 have been removed from the Roof level in the modified model; however, 36.06 sq ft of Slab of Type FS-2 200 has been added.